Covering the biggest part of Myanmar's northwestern sea coast, Arakan faces the Bay of Bengal and shares its northern border with Bangladesh and India. Called either Roshang (in Bengal), Rakhangapura (in Sri Lankan chronicles), Yakhai (in Ayutthayan chronicles), or Rakhine by its own inhabitants, the study of the history of Arakan has suffered from the area's peripheral situation, at least in the divisions of Asia familiar to us. It was seen either from the viewpoint of the Irrawaddy Valley kingdoms, Bengal political centres, or the key locations of European trading companies. As its history during the early modern period has always been the best-known part of its long past, particular traits were highlighted and the area was easily subsumed into either a South Asian or a Southeast Asian political and cultural geography. For centuries, it was home to the famous Mahamuni statue which, according to the local tradition, was modelled during a visit of Siddhartha Gautama himself into northern Arakan. Forcibly removed to Mandalay after the country was conquered by the Burmese in 1784, it has always been the focus of an intense religious fervour, notably by the Theravada Buddhist kings of Mrauk U, the old capital of Arakan. Its predominantly Tibeto-Burman population who speak a dialect of Burmese, clearly puts Arakan on the map of Southeast Asia. On the other hand, the roots of its Indo-Buddhist culture stretch back to the first millennium, with the early presence of an Aryan population there, and its later exposure to the cultural impact of the Muslim sultanate of Bengal connects it to the larger world of South Asia, as well. Arakan definitely lies on an Asian Frontier. Recent interest in Arakan has tended to focus on trade and cultural relations in the context of Indian Ocean and Bay of Bengal Studies, and on the study of an autonomous polity between the fifteenth and eighteenth centuries. Portuguese and Dutch sources now contribute a great deal to a better understanding of the policy of the Arakanese kings and their economic bias towards trade in the heyday of their kingdom in the early seventeenth century. They complement our study of Arakanese and, occasionally Burmese, chronicles and encourage a more critical reading of accounts like Friar Manrique's Itinerario. Studies in art and archaeology have unfortunately been few, but raise the question of safeguarding some of Asia's most original religious monuments and the remains of Mrauk U's outstanding fortifications. The study of Arakan is now an integral part of Indo-Portuguese studies pertaining to what S. Subrahmanyam called 'the improvising empire' of the Portuguese beyond Goa's control. The Luso-Asiatic communities that made their livelihood by raiding the coast of Bengal and trading slaves contributed tremendously to Arakan's prosperity. They settled mainly in the area of Chittagong, a port and city that, after its conquest by the Arakanese around 1578, became a cornerstone of their control over the northeastern shores of the Bay of Bengal. Arakan's kings were tremendously interested in the importation of labour both from Lower Burma (after the fall of Pegu in 1598/1599) and from Bengal. People with manual, artistic or any other skills who were enslaved could not be sold in slave markets but were drafted into royal service groups. Christian and Muslim mercenaries were an important element in Arakan's naval forces, the backbone of its military strength. Genetic studies could easily prove to what extent Arakan became an ethnic melting pot during its period of expansion (approx. AD 1570-1630). 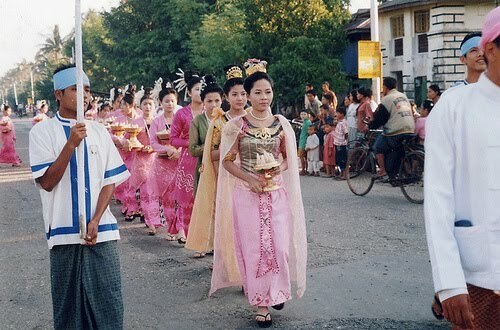 The cultural symbiosis between rituals and beliefs held at traditional Southeast Asian Buddhist courts, and the prestigious style and formal expressions of Indo-Muslim culture brought to Arakan by high-ranking Muslim dignitaries were salient features of the royal court of Arakan. While there is no doubt about the Buddhist character of the monarchy, the perceived cultural impact of the sultanate of Bengal has now ignited a fruitful discussion on traits of Islamization. After forty years of Burmese occupation (1784-1825), Arakan fell (coincidentally with Tenasserim) under British administration as a result of the First Anglo-Burmese war. Unlike the early colonial history of Tenasserim, the first decades of Arakanese history under the English remain largely unknown. The presence in contemporary Arakan of a Muslim minority, fast increasing since the middle of the nineteenth century, is a legacy of the colonial period. Unlike those of the ancien régime, these Muslims, of mainly Bengali origin, were not culturally integrated and played a part in history of domestic conflicts in Myanmar after 1947. They then claimed an identity of their own and organized themselves in the so-called Rohingya movements. While many authors underscore Myanmar's multi-ethnic character and diversity as part of a wider Southeast Asian identity, the mainstream historiography of the country has concentrated its efforts on studying the past of the Irrawaddy Valley. This is undeniably a consequence of the sources available but, as long as it is not balanced by alternative approaches, it emphasizes the one-eyed nationalist agendas of the dominant ethnic group. Myanmar needs historians who look not only beyond its actual political borders in their study of national history, but who look at its component parts differently as well. Regions designed as areas of study need not necessarily be defined by ethnic criteria. Arakanese history is a case in point as it stretches over an area extending from Cap Negrais to Dhaka, occupying a much larger space than the present-day Rakhine state. While its economic basis was the rice-growing plains of the Kaladan and Lemro Valleys, its orientation towards naval power and openness to foreign trade and influence set it apart from the Upper Burma kingdoms and invited comparisons with the Indonesian world. Similar contrasts could be highlighted while comparing the Irrawaddy Valley-based kingdoms with the Shan (Tai) country or, further south, with Tenasserim, whose history belongs to Thais, Mons, Burmese, and other smaller ethnic groups alike. Dr Jacques P. Leider has a strong interest in comparative studies on Burmese annals and chronologies and is starting a project on the studies of coastal Burma and its integration into the cultural and economic networks of Southeast Asia and the Indian Ocean. He teaches history in Luxembourg.